Hopis are a reverent people whose life revolves around the ceremonial cycle of the year. To derive water in this desert land, they developed a complex religion to secure supernatural assistance in fulfilling their needs. One element of this religion are the Kachinas. Kachinas are the spirit essence of everything in the real world. During the summer growing season, Kachinas appear in dances in the plazas. Each village decides what, if any of these dance will be open for non-Hopis to attend. “Katsinam are Hopi spirit messengers who send prayers for rain, bountiful harvests and a prosperous, healthy life for humankind. They are our friends and visitors who bring gifts and food, as well as messages to teach appropriate behavior and the consequences of unacceptable behavior. Katsinam, of which there are over two hundred and fifty different types, represent various beings, from animals to clouds. During their stay at Hopi, the katsinam appear among Hopi people in physical form, singing and dancing in ceremonies. On Third Mesa the katsinam arrive in December while at the First and Second Mesa they arrive in February at the Bean Dance Ceremony. Night dances are held until the end of March, followed by day dances from May to July. Virtually no weekend goes by during this period without a katsina dance in at least one Hopi village. Most dances start shortly after sunrise (mostly on Saturday and/or Sundays) and continue intermittently throughout the day, with breaks for lunch and rest periods. The ceremonies usually end at dusk. Several of the villages often hold dances on the same day, giving visitors the opportunity to witness parts of several dances by spending a few hours in different villages. Niman (Home Dance), which takes place in July, is the last katsina dance of the cycle. At the end of this day-long ceremony the katsinam return to their spiritual home at the San Francisco Peaks, Kisiau and Waynemai. The Katsinam who carry out the religious dances are sacred to us and require specific codes of conduct in their presence. Misinformation about these customs and lack of knowledge about the physical conditions of Hopi plazas were the core of conflicts in the past. While we believe that the Katsinam perform public ceremonies for all people, plants, animals and spirit life, modern conditions make it next to impossible to accommodate all outside visitors. First, there is limited space in the plazas and our rooftops were not constructed to support the weight of hundreds of spectators. Second, sanitation facilities, food, water and emergency services are not designed to serve large crowds. Finally, spectators were originally Hopi villagers and invited guests who were fully aware of the purpose of the ceremonies and how to behave appropriately while attending. Hopi artists, usually men, carve likenesses of the Kachinas from cottonwood root (which is associated with water). In Hopi life they are given to girls at the Bean Dance and the Home Dance to teach them Hopi ways and of course today they have become an art form popular with collectors. The old style dolls are not put on stands, are flat in the back, and are simpler in form and painted with natural pigments and usually hung on the wall. The modern style have more realistic details and are placed on stands for display and look more like the kachinas that appear in the villages. The contemporary sculpture form is the artist’s own creative interpretation of traditional forms and is an art form all of its own. Youth really enjoyed getting school supplies that was part of our Hopi winter gifting program. We did our food delivery to dozens of families in 6 villages along with 30 boxes of gifts from Teber Amos, several cases of school notebooks/art supplies from Edmund Brickfield, and some sport items we purchased in mid-January. The families really appreciated the food and gifts. They really live the way of giving and sharing and gratitude. We felt blessed to shared this day with them. We also really appreciate The Sugarbaker Foundation, Karen Edwards and an anonymous donor in Colorado who gave us the foundation of our Hopi Holiday gifting project budget this year. Along with dozens of other donors who cumulatively made this possible. I also want to give a shout out to those who shopped directly for the Hopi Head Start kids on their own: Kathy Dunham, Jackie Klieger, Courtenay Murphy and Tebor Amos. I also thank Teber for continuing to be a helper angel to a large family in need. And gratitude to Charlie Tinley who in 1999 instigated this project and continues to be a big cheerleader and spreader of the word. Thank you to our local team who womaned the donation tables, shopped, packed, loaded and delivered! Sorry it took so long to get out some photos of our projects. Kathy Dunham speaking of Jan. food and gift delivery time with our Hopi friends. Thank you each and every one of you for the monetary donations and heart energy behind it that made this possible! Your donations provided new coats and clothing for several dozen of the Hopi Head Start kids. We had a special donation from Mary Beth Nowak to purchase beds for children who were sleeping on the floor. We also purchased art supplies and play equipment for the 5 Head Start classrooms. We sponsored Ramson Lomatewama to make a presentation on the Life Cycles of Hopi youth in Sedona. A very informative visual presentation, after which he fielded many questions from the audience. The Life Transitions of Hopi Youth program in Sedona with Ramson Lomatewama was a great learning experince. Ramson fielded questions for more than an hour after his talk and promises to return this fall with another informative visual program regarding an aspect of the Hopi corn harvest. We made a donation to Natwani Coalition to support their outreach program to educate young Hopis. 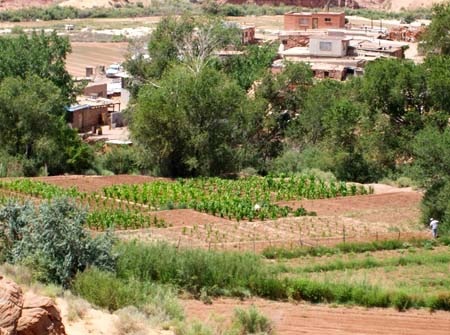 This group is very dedicated to restoring Hopi farming and healthy diet! We have made an initial donation in support of bringing Hopi presenters to the Sept. 29-30 Native American Culture weekend. We hope to support bringing these presenters for cross-cultural sharing: Natwani farmers, Hopi dancers and a young family who needs this experience to grow their skills and sell their art as they rarely have been off of the Hopi reservation. “I attended my first Verde Valley festival. I really enjoyed the storytelling and was impressed that so many Native Americans have ancestors over 100 yrs Young! A sign of a healthy lifestyle. I also spoke to a Dine blanket weaver (Winnie). After watching a demonstration of how wool is spun into yarn, which is then hand dyed before putting on the loom, coupled with the techniques of weaving and creating a design, I have a much greater appreciation of the work involved and cost of each rug. It made me want to learn this Art to keep it alive for future generations.